Are you wondering how a Line-X bedliner compares to a DualLiner? Here’s our good-faith attempt to give anyone considering our product and the Line-X product a fair rundown of the pros and cons of each bedliner. We’re going to start with the cons first. Most of the cons that come with buying or owning a Line-X liner have more to do with the installation process than anything else. It’s not as if the specific chemical formulation Line-X uses has some sort of serious flaw or shortcoming. The issues with Line-X bedliners are the same issues that many spray-in bedliner customers complain about. Are you ready to order a Line-X bedliner? You can’t, at least not from their website. You either have to find a local installer on your own or use the Line-X website to submit a request for contact and wait for a reply. When you find a Line-X installer, they may ask you to bring your truck down to their shop to give you an estimate. While a visit to the installer’s shop may be helpful – there are a lot of different Line-X options (7 different products are mentioned on the Line-X website) – it’s not necessarily convenient to visit a shop and listen to the info on the various options. Line-X installation prices can vary greatly from one installer to another. Every Line-X installer is free to set their own price…so you definitely want to shop around to avoid getting taken advantage of. Speaking of pricing, Line-X spokesperson Cristin Liveoak told USA Today that the average spray-in liner cost $450-$550 to install. That’s at least $50 more than the DualLiner, and as much as $150 more. Overspray problems are real, at least if you believe forum posts about Line-X overspray on passenger doors, bedsides, hood and windshield, or even the entire side of a truck. While it’s probably fair to say that these types of problems are rare with Line-X installations, it’s probably not fair to ignore the risk of overspray. There’s really no going back. If you decide to have a spray-in bedliner installed, you’re probably going to have a spray-in bedliner forever. While it’s possible to have someone chip and grind away the bedliner material, then repaint your truck bed, it’s not really cost effective. NOTE: You may be saying “Why would I want to remove a spray-in bedliner?” The short answer is that spray-ins may fade and stain with time. At some point, you might not like the way your spray-in liner looks. To be fair, there are some positives to Line-X spray-on bedliners. Line-X offers a lifetime warranty. However, they do ask you to take any warranty concerns you have to your local installer, which isn’t that great if it’s the original installer that screwed up your bedliner install in the first place. Line-X liners are very resistant to damage. It’s hard to damage the bedliner material. When they’re brand new, Line-X bedliners really do look great. The trouble is, all three of these benefits – a lifetime warranty, damage resistance, and great looks – are all benefits of a DualLiner too. You usually have to wait to get your DualLiner delivered to your door. While shipping is usually free, we haven’t found a way to make instant deliveries. You have to do your own installation. Sure, it’s easy – it takes a couple of simple hand tools and no more than 30 minutes of work – but it’s not quite as easy as handing the keys to the spray-in installer and reading a magazine for a few hours while he or she does their thing. We don’t offer a DualLiner for every vehicle. Toyota Tundra owners can’t get the DualLiner (at least not yet), nor can Nissan Titan owners (again, not yet at least). Some people are concerned that our bedliner’s heavy rubber floor traps water between the liner and your trucks’ paint. This is false. First, every truck bed has built-in drain holes. Our bedliner is designed to channel moisture to these drain holes (we actually design each bedliner specific to each truck to make sure water is directed to drain holes). Second, the point of contact between our rubber bedliner floor and your truck bed isn’t flat…it’s actually quite “bumpy.” This is intentional – the bottom surface of our rubber flooring is not flat, as a flat surface would trap moisture. This bumpy surface on the bottom of our rubber flooring also allows for “breathing” – air can flow out from under the mat, preventing any sort of mold or mildew. Scratch AND dent protection. Spray-in liners keep your bed from getting scratched, but they don’t do anything to protect your bed from dents. Our hard plastic sidewalls and heavy rubber flooring absorb damage and prevent dents. Cargo protection. 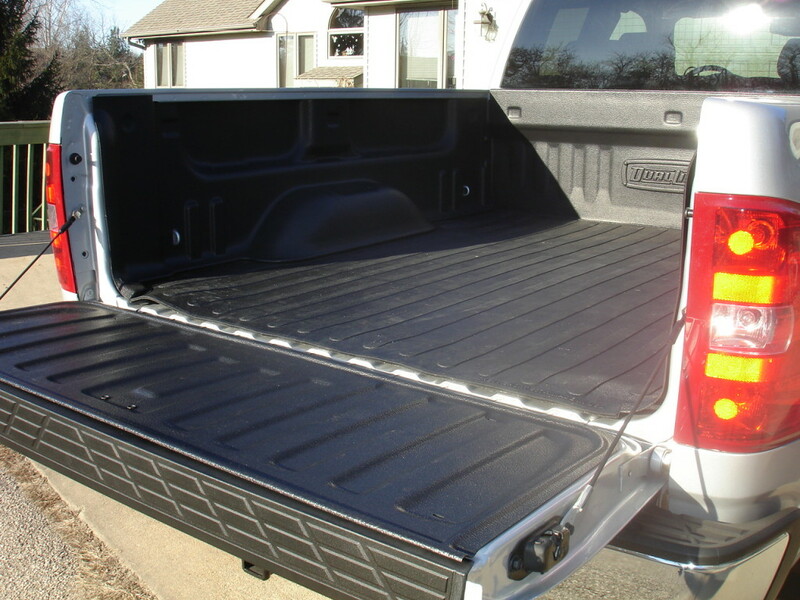 Spray-in bedliners have a very rough surface that can scuff cargo. Our bedliner doesn’t. There are no concerns about installation screw-ups. The DualLiner is so easy to install a child can do it (and we’ve got proof). There’s no risk of overspray, no concern about our bedliner material “failing to bond” to your truck’s bed, etc. Install is fast and simple. Flat, simple pricing and online purchase process. You don’t have to go to a local “dealer” and hope they charge a good price. You just pick your bedliner and order it from our website. Our pricing is fair and plainly visible. Our ZeroSkid bed floor works as promised. When you put a piece of cargo on our heavy bed flooring, the cargo stays put. It doesn’t slide around and get scuffed up. Our bedliners can be transferred from one truck to another. If your truck breaks down or gets into an accident, you can just remove the DualLiner and install it in your new truck (assuming it will fit of course…you can’t take a DualLiner out of a Dodge and put it in a Ford). The DualLiner has a full lifetime warranty that transfers to the next owner. No exclusions on “commercial use,” no exclusions on “new owners,” etc. DualLiner warranties are forever. Seriously, if you think our comparison comes up short somehow, or if you don’t agree or understand, please comment below! I just purchased a new Toyota Tundra and was very disappointed to find out that the Dual Liner is not available. Any plans to bring one to market soon? Thanks! Hi Sean, thanks for checking out DualLiner! At this time we do not have any plans to add Toyota to our line-up. How about in 2019+, and plans to do the Tundra? Does this system interfere with the mounting clamps for tonneau cover mounting rails? Do you offer factory seconds or returned liners for sale at a discount? Thank you for your inquiry. DualLiner ‘s custom-fit component bedliner system is engineered to fit every contour of the truck bed. Thanks to our design, tooling and Quality Control process we do not have “seconds”. Also, because of these processes and the durability of the DualLiner components – backed by our LifeTime Warranty, we do not have returns. Any plans for a DUAL LINER for the 2018 Chevy Colorado Long Bed? Hi Carl, we do not have any current plans to add the Colorado to our line-up. Our 2019 RAM bed liners are in the process of being designed and tested for fitment and we hope to begin selling them soon! There have been changes from the 2018 and earlier model RAMs to the 2019, and as such we have had to re-design our bed liner to match those changes. At DualLiner we believe in bringing you an absolute perfect fit bed liner for your truck, and we won’t settle for anything less. We are aiming to provide that perfect fit for 2019 RAMs as soon as we possibly can for you.